Q. Why isn’t there a mount kit offered for my truck? A. The Drill Free Mounting Platform requires a vehicle specific mount kit that is custom designed to fit the unique features of each vehicle such as, cab roof contours, third brake light angles and interior structures. We support the highest selling vehicles in the pickup truck market. 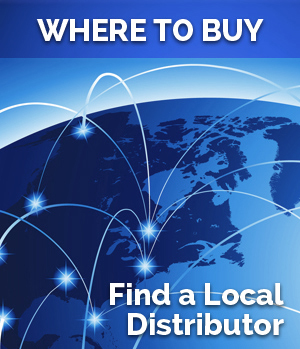 If you have a large fleet of vehicles that you would like us to consider please contact your local sales representative, we may be able to help. Q. I can’t get the platform all the way up to a level position. A. There are structures inside the cab that the clamps must clear. You can manipulate the clamps by pulling back on the bolts to ease them over the roof support while skimming along the underside of the cab skin. Q. 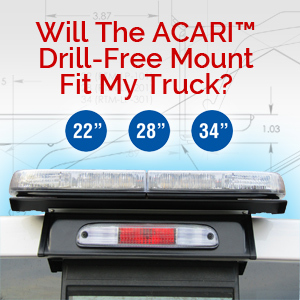 Can I mount a full size lightbar to the Acari Drill Free RTM? A. The weight limit on the platform is 30 lbs. we do not recommend mounting any accessories that reach over the length of the platform by more than 6” on either side. Q. Why can’t I use a magnetic mounted accessory with the Acari Platform? Q. Can I use the Acari mount as an electrical ground for my accessory? A. The Acari Mount will not serve as an electrical ground. Although the platform is metal, it is mounted to the truck with rubber gaskets. Please follow your accessory’s manufacturer’s installations instructions for proper grounding. Q. Why can’t I use a standard RTM-101/201/301 on the 2015 F-150? A. The 2015 F-150 has a much larger 3rd brake light opening than all other pickup models. We designed a lower unit specific to the F-150 to accommodate the 2015 model change . The RTM for this vehicle will only ship as a complete kit and the lower unit can only be used on the F-150 with the 2015 and up model change. This now applies to 2017+ Ford Super Duty models.